As the Sri Lanka Cricket Inter-Club Premier approaches third week of play Army Sports Club and NCC continue to dominate the respective groups which consist ten teams each. Army SC leads the Group ‘A’ followed by Colts and Bloomfield. The Soldiers and Colts remain unbeaten with two wins under their belts. Bloomfield too are unbeaten but after finishing their two matches with a win and a draw. NCC with a good track record leads the Group ‘B’ followed by Tamil Union and SSC. All three teams remain unbeaten after having recorded two wins each. Among the top ten batsmen in the present competition are NCC’s Upul Tharanga and Angelo Perera, SSC’s Dimuth Karunaratne, Tamil Union’s Jeevan Mendis, BRC’s Dilshan Vitharana, Saracens batsman Lasith Abeyratne, BRC’s Malith Cooray, SLPA’s Ashan Priyanjan, Galle CC’s Irosh Samarasooriya and Tamil Union’s Kithruwan Vithanage. 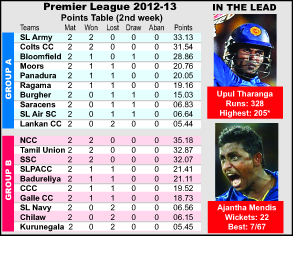 Army’s Ajantha Mendis leads the bowlers list followed by off-spinner P.H.T. Kaushal of NCC who is playing his debut first class season. Others among the top ten are Suraj Randiv of Bloomfield, Saliya Saman of Badureliya, Colts’ skipper Sajeewa Weerakoon, Panadura’s Gayan Sirisoma, Army’s Seekkuge Prasanna, Moors’ Malinda Pushpakumara, CCC’s Dinuk Hettiarachchi and Panadura’s Dilruwan Perera.